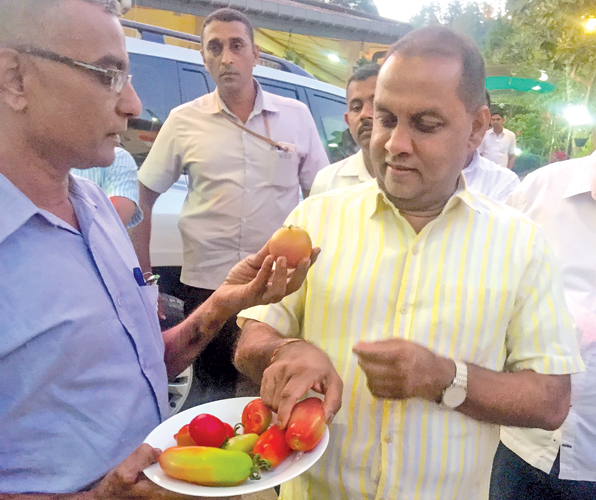 Agriculture Minister Mahinda Amaraweera on a recent inspection tour of San Marzano tomato fields in Bandarawela. The Agriculture Ministry plans to promote a new high-yield tomato species called ‘San Marzano’ among local farmers, considering the growing demand for tomatoes which is a result of the arrival of a number of large international fast-food chains in Sri Lanka. The Agriculture Department has already tested this species in long-term field experiments in the Bandarawela area. Compared to the tomato variety currently grown in Sri Lanka, San Marzano tomatoes are thinner and more pointed. The flesh is much thicker, with fewer seeds, and the taste is stronger, sweeter and less acidic, Agriculture Department sources said. San Marzano can be cultivated in both wet and dry zones of the country. San Marzano tomatoes originate from the small town of San Marzano sul Sarno, near Naples, Italy, and this variety is used in pizza toppings. The Ministry also plans to promote value-added food products with this new tomato variety.